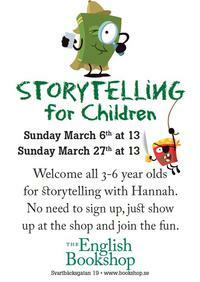 This Sunday at 1pm in the Uppsala shop, Hannah will read stories in English for children aged 3 to 6. We have the most amazing book sale tomorrow in the Uppsala shop! The entire Penguin Great Ideas series! The entire brand new Penguin Mini Modern Classics series! All of the cloth-bound classics from Penguin that Coralie Bickford-Smith has designed (our favourite designer!!!) INCLUDING the new Fitzgerald editions!!! A selection of other titles. Everything at 3 for 2, cheapest book free! We at The English Bookshop are very proud to announce that Helena D. of Bokhora and Dark Places fame, will start blogging with us occasionally. Read her reviews at Helena's Blog! Meet the author at The English Bookshop in Gamla Stan at the book signing on Saturday, February 12 from 11 a.m. - 2 p.m. Welcome to a cozy evening meeting in the bookshop to discuss the month’s book. During the evening we’ll talk about the book and enjoy each other’s company as well as a nice cuppa’ tea and some delicious cake. And you get 10% discount on everything! The cost is only 50:- + book 114:-. (Oh, that includes the delicious cake as well!) Limited number of participants (max 10), so talk to the book- sellers and book your seat today. What I read on my Zanzibar vacation! Kevin MacNeil is from the Isle of Lewis, which in gaelic is Leòdhas. Lewis is half of Lewis & Harris (Leòdhas agus na Hearadh) which is part of the Outer Hebrides (Na h-Eileanan Siar). So the answer we were fishing for was Leòdhas. And the winners are: Veronica S in Täby and Merimbe in Lund! Congratulations! When ordering from the web bookshop you can now easily choose if you want to pick up your oder in the Uppsala or Stockholm bookshop. New Competition! Win a copy of Kevin MacNeil's new book! A few years ago Caledonian author Kevin MacNeil was writer-in-residence at the local uni, and it's been a while since we heard from him. But now he's back with his new novel A Method Actor's Guide to Jekyll and Hyde, and we have two signed copies to raffle off. Just e-mail us the answer to this question: What is the Gaelic name of Mr MacNeil's island of origin? The winner in our fabulous Kat von D competition announced!